If you want to make sure you never get an offer on your home, then have these little creatures at the front door waiting to greet your guests. They like to secretly jump on people, but wait until they leave the home to let their presence known. A year ago I was showing a four-plex to a young couple who were looking to invest. The last unit we looked at had ugly emerald green carpet, and smelled terrible. (It was vacant). We walked outside and started talking about drawing up an offer on the complex. That’s when I started itching my feet. I looked down and discovered by legs were covered by hundreds of fleas, as were my clients. Let me tell you, I hate fleas. They make my skin crawl. So instead of talking about an offer, we were combating the fleas. We all tried getting as many off as possible, then jumped in our cars to go home. I was bitten the entire drive. Once I got home, I had to strip down in the garage so as not to bring them into my home and onto my pets, then take a shower to get the rest off. My clients later told me a similar story. Needless to say, they bought another complex instead of that one. Yes, fleas killed that sellers deal as the buyers were going to make an offer. But the thought of having to kill the fleas, tear out the carpet, etc, was a project my clients would rather not do. So if you have pets, I cannot stress the importance of making sure you do not have fleas. If you plan on moving out before the sale, make sure you bomb the place or replace the carpet. 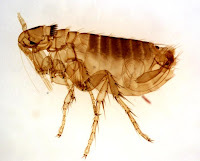 Fleas seem to multiply once the animals leave and attack the next source of food they see…us humans.